Just getting in touch with my Swedish roots, and painted this little Dala horse. It's a Swedish icon, and has been around for many centuries. It was created by Swedish woodcutters in the province of Dalarna, and during the long winters, men would spend their evenings carving little toys for their children. Getting ready for the holiday season, and will release my Holiday card this year next week. 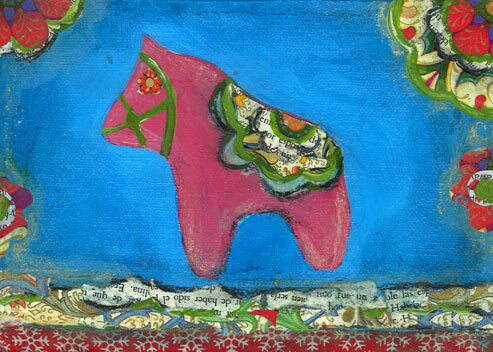 It's similar to the Dala horse folk-art-theme. Also, getting ready to be a vendor at the Skinker-DeBaliviere wintermarkt Saturday December 3rd 11-4. If you live in the area, stop by and check out the local artist of St. Louis. I am lover of art, painting, collage, and color! In my paintings I like to use intense colors to convey my love of nature and life! I find pleasure in the process of learning new ways to transmit joy through my art.